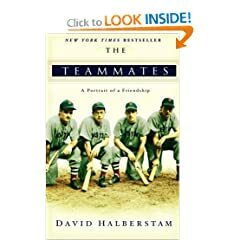 I just loved David Halberstam’s book, The Teammates: A Portrait of Friendship. It tells the tale of Dom DiMaggio, Johnny Pesky and Bobby Doerr’s last visit to see their friend, Ted Williams, before he died. It was the story of 4 friends who shared more than a love for the national past time. I am reminded today because another of those friends passed away. While watching a replay of last night’s Red Sox victory over the Indians, Dom DiMaggio passed away. The brother of Jolting Joe DiMaggio, he was a superb player in his own right- being a 7-time All-Star. Ironic that he was the brother and teammate to the 2 greatest hitters of that era, and all-time. Williams is the last man to his .400, and his .406 may never be eclipsed. Joe’s 56-game hitting streak, the same season, is also most likely untouchable. More irony, Dom holds the Red Sox hitting streak record to this day. He drew great praise from those superstars. Ted called him the best lead off man in the American League. Joe called him the best defensive centerfielder he’d ever seen. After baseball Joe was a successful businessman. He was one of the original owners of the Patriots, and tried to buy his beloved Red Sox. He was able to excel at the very thing his superstar friend and brother struggled the most- family. He was not merely admired for his athletic skill, but for his character and intelligence. All true Red Sox fans have a special place in their hearts for Dom. I am so glad the Red Sox are wasting no time in honoring him. I’ve come across Total Church: A Radical Reshaping around Gospel and Community via the internet. A growing number of church planters are utilizing the concept. Steve Timmis, one of the authors of the book, is the new director of Acts 29 Europe. The San Diego Church Planters’ Boot Camp, hosted by Kaleo, was on Total Church. I’ve begun to listen, and just borrowed the book from a friend. The concept is intriguing to me. The church is a gospel-formed community of people being gospel-shaped. They have a community-centered understanding of the gospel, which runs counter to the individualistic mindset of most Christians and churches today. I’d like to consider the relationship between the gospel, community and mission more thoroughly. It seems less like the “latest, greatest program” or method, but an attempt to return to the power of the gospel, and the emphases of the gospel. DG: Tim, what do you and Steve Timmis mean by the title Total Church? Tim Chester: The phrase is actually adapted from the world of football (or soccer in the States!). “Total football” was a style of play associated with the Dutch international side in the 1970s. 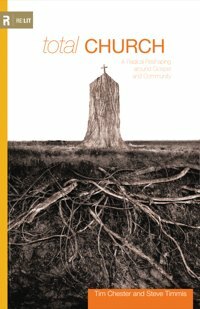 “Total church” is our way of capturing the idea that church is not one activity in our lives. Church isn’t a meeting you attend or a building your enter. It’s our identity, our community, our family. It’s the context for the totality of the Christian life. DG: How would you summarize the message of the book? TC: Total Church argues for two core principles: We need to be gospel-centered and community-centered. Being gospel-centered means we’re word-centered (because the gospel is a message; it is good news), and it means being mission-centered (because the gospel is a message to be proclaimed; it is good news). I think most conservative evangelicals are strong on this. But we also need to be community-centered. The Christian community is the biblical context for evangelism, discipleship, pastoral care, social involvement, and so on. That doesn’t mean meetings. It means the shared life of the community. One of our catchphrases is “ordinary people living ordinary life with gospel intentionality.” It means doing the chores, having meals, watching sports, and so on with an intention to talk about Jesus, to pastor one another with the gospel, and to share that gospel with unbelievers. DG: At several points in the book, you mention the value of hospitality. Do you see this virtue as lacking in the church today, and is there is an especially significant need for it in the 21st-century church? 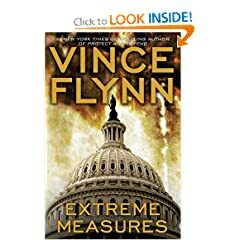 TC: Here’s what I think is the key issue. In the book, we tell the story of a young man who invited us to do some street preaching with him. When we said it wasn’t really the way we did things, he clearly doubted our courage and commitment. We began to talk instead about a whole life lived in mission and community, in which we were always looking to build relationships and always looking to talk about Jesus. By the end of the conversation, he admitted he wasn’t sure if he was up for that. He wanted evangelism you could do for two hours on a Saturday afternoon and then switch off. Tick. Job done for the week. He didn’t want a missional lifestyle. I think that’s the issue with hospitality. People want to put church and evangelism into a slot in the schedule. But we need to be sharing our lives with others—with shared meals and open homes. That can be demanding, but it’s also wonderfully enriching.